As you can see, the symbol of Superman is used deliberately. The first idea that came to my mind when I was developing the map was to draw a really eye-catching symbol in the central position so that it can easily be associated with the tense given. Why Superman? The initial S is a really distinctive feature of the Present Simple Tense, since it is added to the verb used with the third person singular. In particular, English-learners will often forget to add –s when they use the Present Simple. 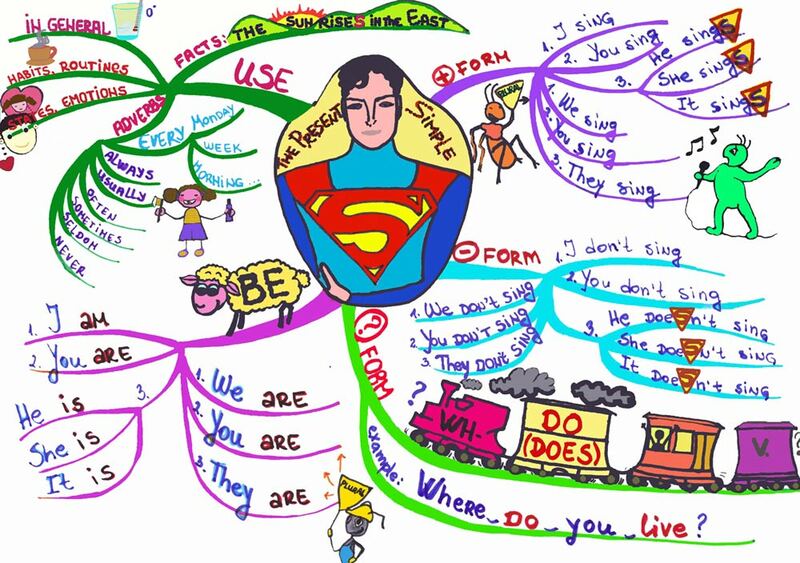 The central drawing is here to remind the visual types of learners not to forget the most specific fact concerning the grammatical form. As you can see, the purple branch gives a clear illustration of the positive form of the verb given. The ant here represents plural since ants are numberless insects. The light blue branch represents the examples of the negative verb form. It can be noticed that the third person singular form contains the notorious s once again. It is emphasized again in the same way. The green branch gives a vivid picture of how questions are formed in the Present Simple Tense. The train engine is an optional part of a question, the fact which is usually stressed by the teacher. The next, obligatory carriage, shows the place of the auxiliary verb do/ does in the Present Simple Tense questions. Then comes the subject that waves at the window of the third carriage. The main verb follows. Next, we can see the smiling sheep. The verb to be is represented by a sheep, since the onomatopoeic sound that sheep produce (funny enough, but in Serbian particularly) is: /be/. Moreover, it was meant to be a black sheep, the one that is regarded as a failure or an exception by the rest of group members . This symbol is useful here since the verb BE is really an exception, concerning the negative and question forms, which are formed without any auxiliary form. Finally, the use of the Simple Present is shown in the left upper corner of the map. It is used for stating facts, general truths, habits, routines, for expressing states and emotions. In addition, many branches are drawn which show the most common adverbs used with this tense. All in all, the above map shows how learning English can be fun. It is particularly interesting for children. The adults find it useful likewise because of its many associations. Now, don’t hesitate! Take your markers, color pencils and crayons and draw whatever you learn. You will absorb the new content much faster! The central drawing is here to remind the visual types of learners not to forget the most specific fact concerning the grammatical form. As you can see, the purple branch gives a clear illustration of the positive form of the verb given. Excellent map, help me a lot.